The strange love triangle of two young men and the sea. 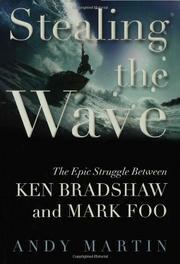 British journalist Martin presents the longstanding rivalry between big wave surfers Ken Bradshaw and Mark Foo as a world-shaking clash of titans, a dialectical struggle of mythic scope and profundity. His protagonists are two legendary pioneering Hawaii-based surfers who, forced together by dint of their prominence in the scene, struck all manner of sparks off of each other, developing a complex relationship that progressed from hatred to grudging respect to eventual partnership and, ultimately, tragedy. The two men could hardly be more different: Bradshaw, a native Texan, hirsute, aggressive and monastically devoted to the ideal of “pure” surfing, took the sport so seriously that he literally bit chunks out of the boards of dilettantes who failed to recognize and respect the protocols of “his” turf, Waimea Bay. By contrast, Mark Foo, a diffident, charming Chinese American with movie star looks and charisma, devoted himself to exploiting his freakish natural talent for riding massive waves to reap media attention, financial rewards and women. As the two men came to dominate Hawaii’s unforgiving North Shore, conflict between the two was inevitable, and Foo in due course found himself with a Bradshaw-chewed board. Martin persuasively and vividly conveys the psychology and personalities of these outsized figures, and the gradual rapprochement of the bitter rivals becomes fascinating and oddly touching. The tragic death that claims one of the men at the end of the book has surprising emotional power, its ironies and grimly inevitable quality fulfilling the “epic” claim made in the book’s title. There is also much interesting information about the history of surfing and the Hawaiian culture that nurtures it, and Martin, an avid surfer himself, deftly evokes the excitement and terror of riding a 30-foot wall of water. A passionately written, engaging sports narrative.